Dwarkadheesh is another form of lord Krishna. The temple in the below photograph is the main temple of Dwarka. 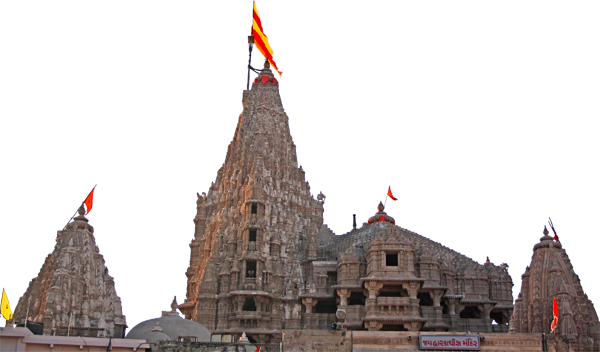 Almost all the people who visit Dwarka have their main purpose to visit this temple. It's considered a very holy place. The flag above the temple is very special; it has 52 small individual flags woven on its border, and each individual flag measures 1 yard. Wow...I have plans to visit Dwarka. Thanks for showing the temple in advance. The architecture is very appealing to me. What a beautiful place. The positive energy is radiating through your photograph. I hope to have the opportunity to visit one day. Peace to you. Yes, the positive energy radiates here! Great composition. The flags look very colourful. That is some incredible temple.. Thanks for sharing information about Dwarkadhish temple. The temple is a a perfect destination for a great time with your dear ones and also enables you to steal a self-indulgent moment for yourself as well. And when it comes to connectivity, nearest airport to Dwarkadhish Temple is Udaipur airport which is 48kms away from it. YouTube and China. What is Happening?